Master the path of the ahoge, with just your finger! Hard boiled battles collide with silly moe cuteness in this unexpected comedy-action game now available in the Google Play Store. After Ahoge Chanbara’s celebrated release on iOS, we’ve responded to fan demand by springing up in the Google Play Store. View the trailer, character profiles, and more at http://ahoge.jp ! As all serious otaku these days know, “ahoge” refers to the little sprig of hair often seen popping up from an anime character’s scalp. Now, you can wield an ahoge in battle for a hair raising game like no other! 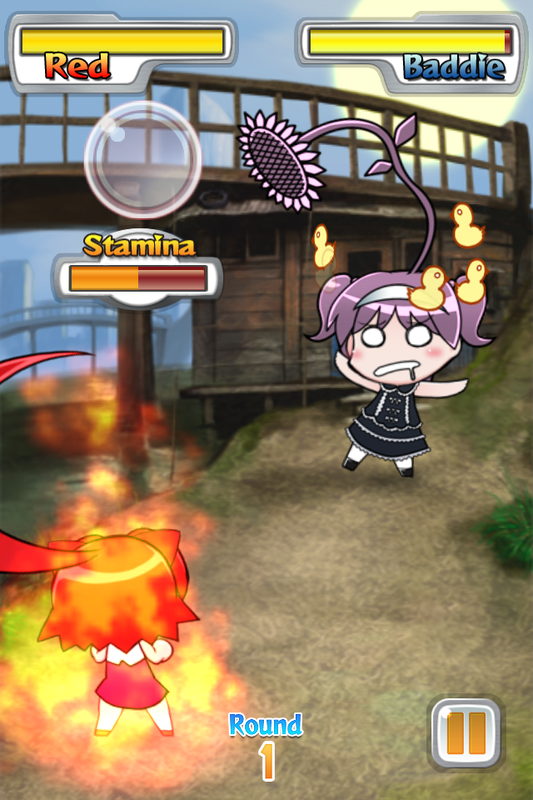 Wacky yet cute enemies appear one after another… Knock em out with your ahoge before things get hairy! Use the simple controls to attack and defend at will in these ahoge battles where the loser loses… their hair! Developer M2 is no stranger to the game industry, with previous releases being on various home consoles. True gamers will be able to appreciate the experience of staff members like Director Manabu Namiki (Game music experience includes Battle Garegga, DeathSmiles, Black Rock Shooter THE GAME, DoDonPachi Sai-Dai-Ou-Jou, KOKUGA, and more), character designer and animator Harukaze Namikai (Best known for his work on Ragnarok Battle Offline), and music composer Jaelyn Nisperos (The Familiar of Zero Fantasy Force 2nd Impact, SEGA Vintage Collection: Theme Songs, KOKUGA OST Remix track, and more). Game music fans are also in for a special treat: Ahoge Chanabra’s soundtrack is available for download via Bandcamp! Using their pay as you like system, you can download free, or send a little something to the creators if you’re feeling generous. In addition to the all the game’s BGM, a bonus remix track is included, so take a listen at http://m2sound.bandcamp.com. Simple controls: use just one finger! Brandish your ahoge in exhilarating action packed battles! Pluck or be plucked… Defeat formidable opponents, and ahoGET their ahoge! If you’re about to topple midway in your journey…. just use a handy item! Unlockable achievements for all the completists out there! Show your friends who’s boss via Game Center! Tweet your favorite ahoge to your Twitter account! Beat extra challenges to unlock cute new costumes! 2 player versus mode. Challenge your friends! What fate awaits after these hot blooded ahoge battles…? Download now and get that finger moving to find out! Japanese game company M2 is probably best known for their lovingly ported retro game releases such as the “SEGA 3D Classics” series on 3DS, as well as their “ReBirth” game series which consists of original sequels to popular classic games. Despite their long history in game industry, only recently has M2 ventured into releasing completely original titles not based on any established franchises. They have also recently gained attention with their 2D character animation tool, E-mote.